My purse knitting has been fruitful! My Helping Hippos Vanilla socks both have heels now! These have seen many a waiting room and lots of windshield time. Pssst….don’t worry the sock feet are the same number of rows. I just managed to snap a picture from some weird angle that makes one look bigger than the other. I guess perspective is a b*tch, lol. Now I just need to cruise up the legs and finish the cuffs. I gotta love me some auto pilot stockinette in the round. It is my happy place lately. I need to catch you up on my Helping Hippos Vanilla sock progress! Thanks to some conference calls at work (PB is now full time daycare so I’m not juggling her at work anymore) and some road hours to visit the grandparents my socks have seen some decent progress! 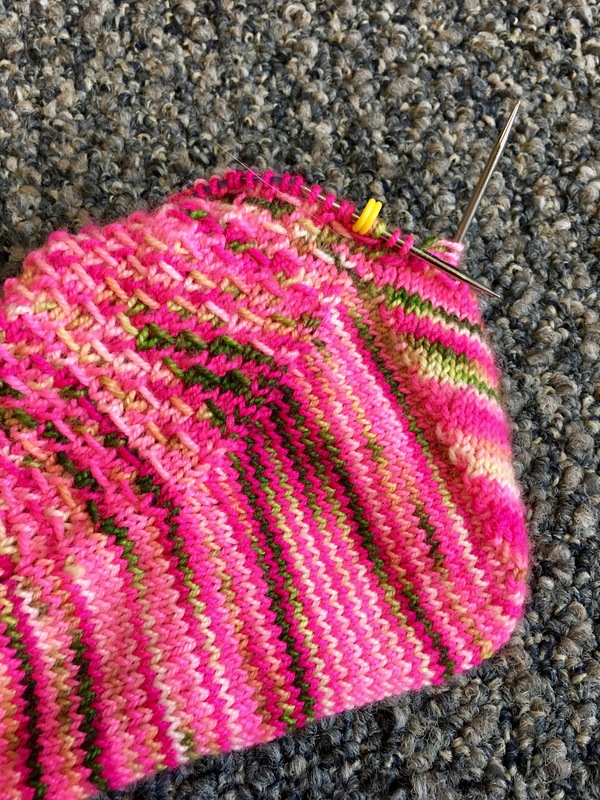 The first sock I started now has a completed toe up gusset heel and is ready to zoom up the leg. The second sock has gained 3 inches of foot. You can seen my progress keeper and corresponding progress. This three inches is the equivalent of both my children napping in the car for two hours on the way to the grandparents. So you know…basically finding a unicorn or the pot of gold at the end of the rainbow! 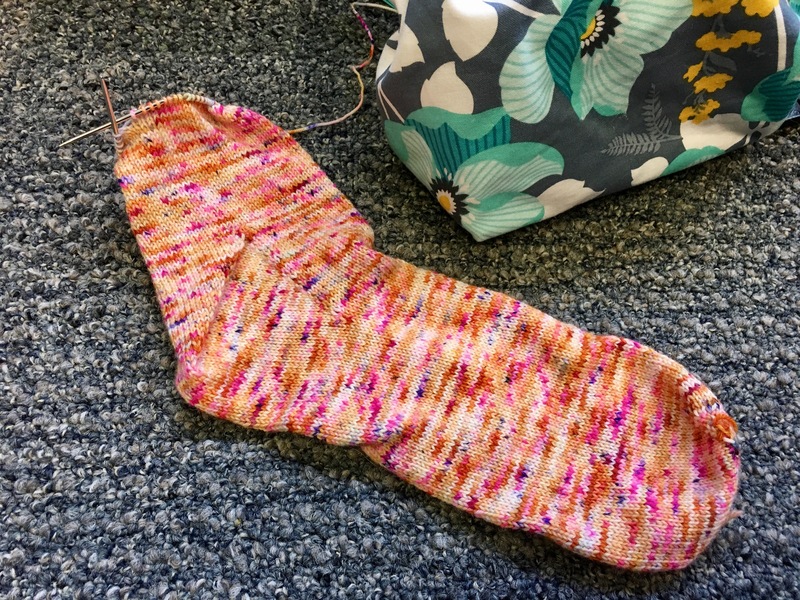 I’m very pleased with the first sock as the speckles really distributed themselves nicely both through the foot and throughout the gusset heel. With speckled yarn you really can never tell how it’s going to end up. But this batch appears to make a fairly uniform fabric and I’m pleased. Thanks to some recent car travel time and my children not being COMPLETELY insane. 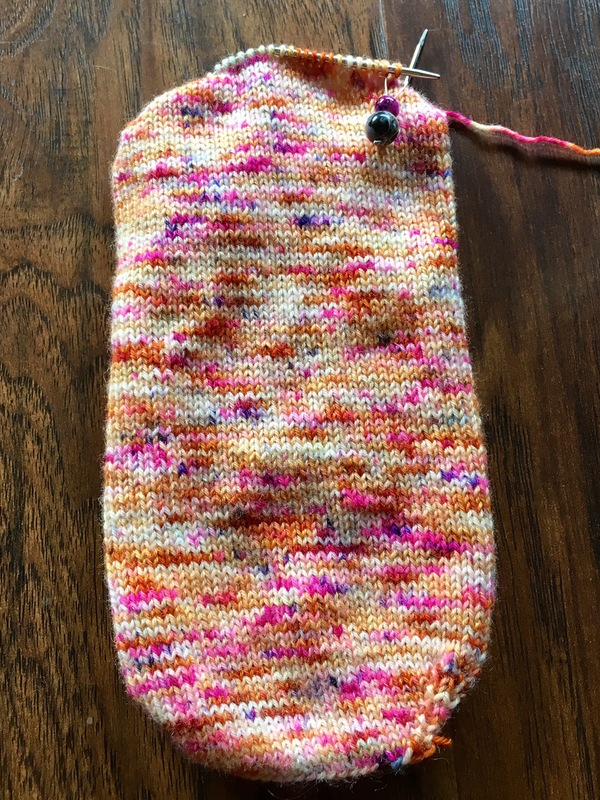 I managed to work a fair bit on my Helping Hippo Vanilla socks! The sock on the right is the first one and it’s ready for the gusset heel. I didn’t have my heel notes handy and I didn’t have a stitch marker either but I still had quite a ways to go on our drive. So I put those aside and started the sock on the left. I mean…I can’t not knit while in the car right? I’m really pleased with the speckles and finding it hard to put them down! In a fit of pregnancy nesting I have been steaming through some of my languishing WIPs in my UFO bin. This week’s project is my Drunken Watermelon socks. Last I shared about this project I was at the progress keeper shown hanging out at the toe. And for this week’s webex and webinar craziness, I worked on this project. I mean it’s just criminal to let Miss Babs yarn sit hibernating for almost a year! I cruised through the rest of the foot and started the gusset increases. I have set a personal goal to get through the heel by tomorrow. The good news is that I have the first sock to compare to and it’s easy to count my rows/stitches so that I can make equal sized socks! You guys….I finished ANOTHER THING! My Vacation Vanilla socks are done done done! My feet and ankles are not there normal size at the moment so pardon the sock blocker only photos. And to be honest I’m not sure how they fit, lol. I will have to stash them safely in my sock drawer until I’m no longer retaining water like the Hoover Dam! But I really adore the speckles. I did notice that one sock appears to have darker tint than the other. Not that it really bothers me and I am well aware this happens with hand dyed indie skeins quite a bit. Just found it a bit odd when I laid them side by side, lol. I have been on FAR TOO MANY webex meetings lately. But the upside is that no one can see me and therefore I can knit while I listen. My pregnancy nesting is starting to pick up some steam and I feel the pull to finish some WIPs before PB gets here. 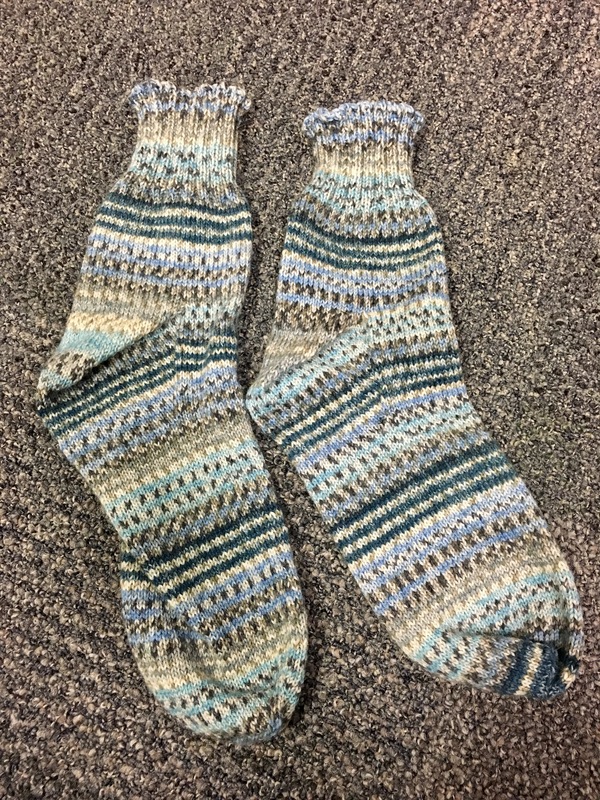 The combo of these two has led to some progress on my Vacation Vanilla Socks that I started in the summer of 2017. 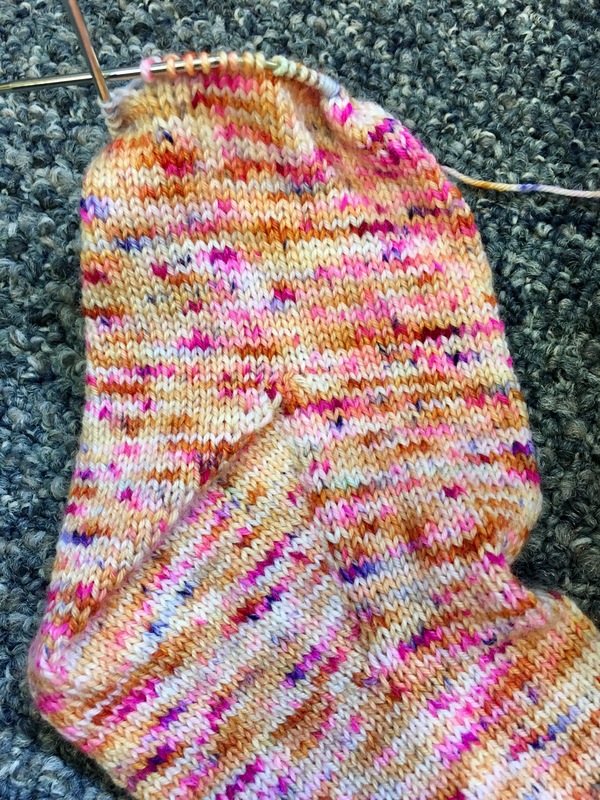 I’m finished with the foot and I’ve installed the toe up gusset heel on the second of these socks. I follow Wendy D Johnson’s instructions for those with inquiring minds. It’s Tuesday morning and I have approximately 7 hours of remote web meetings left this week. Fingers crossed that I can just zoom up the leg and be finished really really soon. One way or another PB will make her debut on or before May 30th…so I only have a little over a month left! 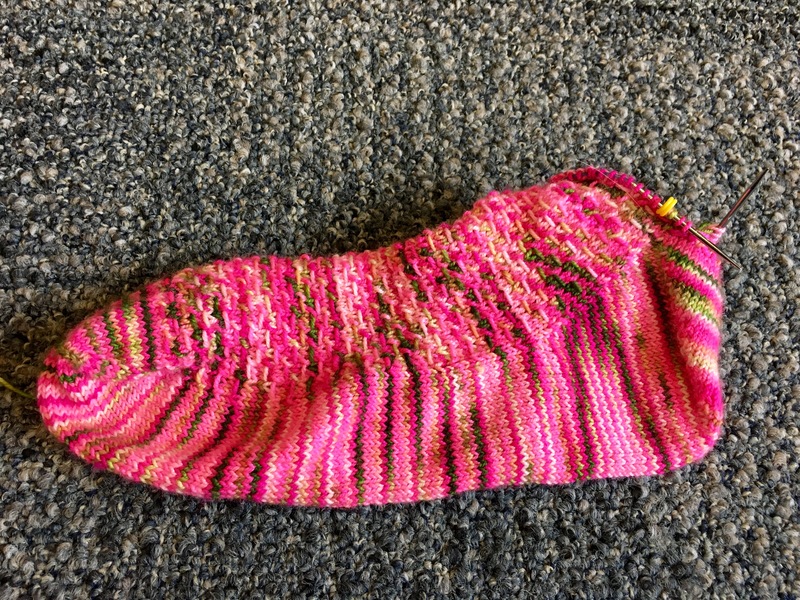 The heel is turned on my Strands of Drunken Watermelon socks! For now I’m just going to admire my heel. Plus now I get to work the pattern all the way around. One less marker to fuss with! Ps. How awesome is Miss Babs Hot shot!?!? My Vacation Vanilla Socks saw a little more progress thanks to a trip to IKEA. Jellybean got a big boy twin bed that doubles as a tent/secret hideout. God bless the swedes….here’s hoping we can sleep sometime soon! I’ve turned the heel and started up the leg. I can’t get enough of these speckles! I had been working from one large cake of yarn. I broke out the scale to weigh the ball and split the yarn into two equal amounts. This way I can maximize the yarn in these socks. Now I’m just going to knit leg and cuff until I run out of yarn. Don’t you just love the happy triangle that a gusset heel makes!? My Vacation Vanilla Socks have reached the heel of the first sock. This speckled yarn has been a soothing project. I love watching the blips of colors pop up. I’m doing a standard gusset heel as it fits me well. I must admit I only add a few stitches to this sock at at time but it’s growing despite my best efforts. My Dad’s Christmas socks kind of fell to the bottom of my knitting bag for awhile. But good news they are done now! Two man sized sport weight socks checked off the Christmas list! These babies weigh a whopping 136 grams which means there are over 370 yards of yarn in them! They even match reasonably closely in yarn pattern. That was a happy accident. How is your Christmas knitting going if that is your thing?